Commercial Dehumidification – Whether there’s a need for fast, reliable and energy-efficient drying, Flexiheat UK has the answer. In new building construction, in renovation or alteration of existing buildings, or in special circumstances such as flooding, there’s no quicker, surer or more economical way to reduce moisture without the risk of damage to the building fabric. 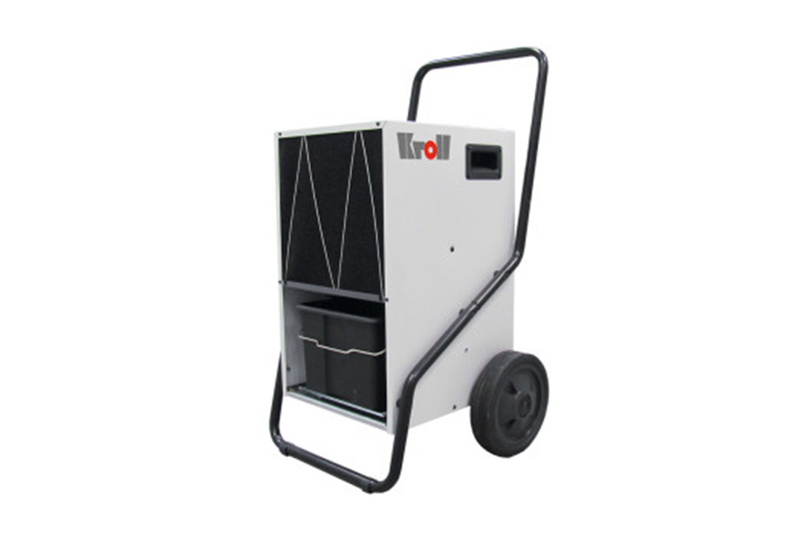 With their unrivalled versatility these Kroll 240 volt commercial dehumidifiers are a popular choice throughout the hire and flood restoration industries where they help reduce the speed of drying times and reduce water damage. The come as standard with hours counters and an integrated hygrostat , as well as hot gas defrost which ensures higher efficiency, with less down time. Differing circumstances present different problems – but the professional Kroll Commercial Dehumidifiers have been designed to provide an effective solution whatever the situation. In newly built or partially completed buildings, Kroll Commercial Dehumidifiers enable interior plaster, screeds and timberwork to be dried at a controlled rate. This means that decorators can work systematically, keeping to the required schedule, regardless of weather conditions. So, if you’re looking for the best dehumidifier to help tackle condensation, damp and mould, we’ll help you find the best commercial dehumidifier for your requirements. • Hours counter – Letting you or your customer see how long the dehumidifier has been operating for. The units are easy to install, immediately ready for use and of silent operation. 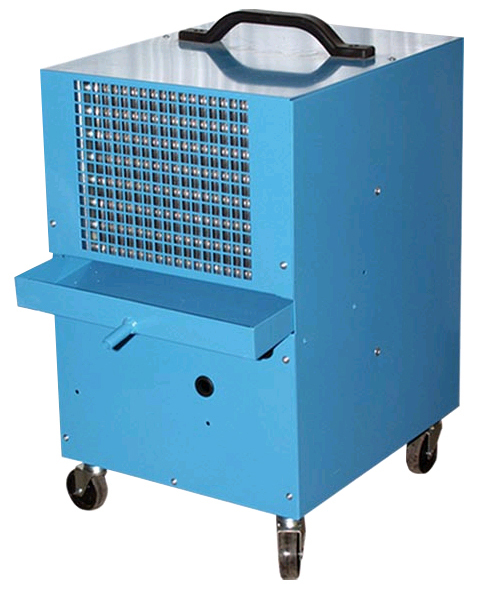 Ensures trouble-free operational so when the unit is running permanently. This leads to an elevated degree of efficiency and very short operation breaks. The robust long life filter-which is easy to clean and increases the units lifespan. CFC-free refrigerant: to protect the environment and the ozone layer. LED display informs about the current operating status. Electronic and safety control for fully automatic operation. The Flexiheat range of commercial dehumidifiers combine very large extraction rates with high quality materials to give industry leading performance. These rugged and reliable units use tough steel bodies and powder coated finishes to take the knocks associated with regular site use while the reduced size and weight help you maximize transport and storage space. With their unrivaled versatility our range of commercial dehumidifiers are a popular choice throughout the hire and flood restoration industries where they help reduce the speed up drying times and reduce water damage. Available in either dual voltage or 230V single voltage only.We also offer a full range of accessories including hour counters, humidistats and condensate pumps which can be added to thesw dehumidifiers for commercial use, if so required. 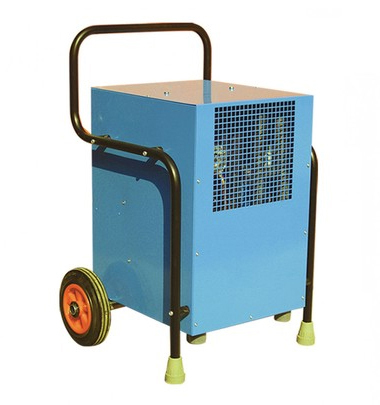 A large capacity commercial dehumidifier ideal for site or flood restoration use. 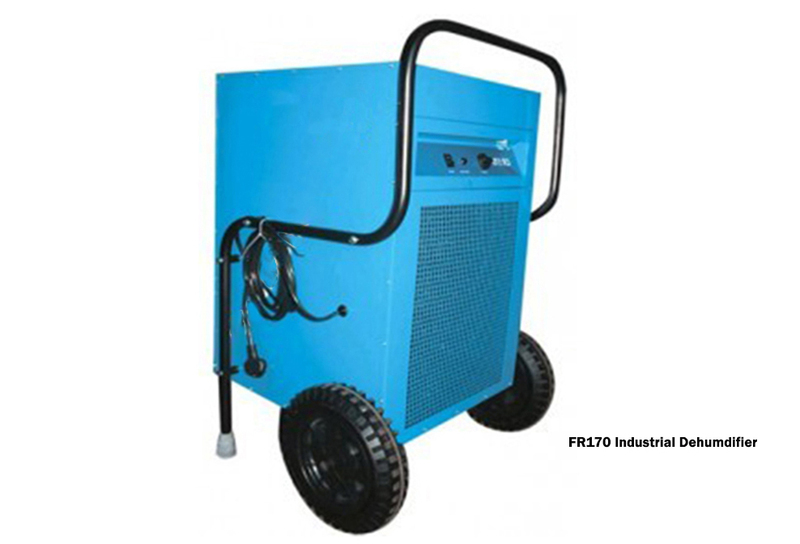 The rugged and reliable FR70’s steel case is built to withstand the rigours of daily site use and it is also available in dual voltage along with accessories including condensate pump, humidistat and hour counter. Our biggest commercial dehumidifier is built tough for use on building sites and in commercial applications whilst still being fully portable. Whether it be the 240 Volt single voltage unit or the dual voltage model the Flexiheat ” FR170″ Commercial Dehumidifier comes complete with a humidistat, condensate pump and hour counter as standard.